Pricing shown is for our standard service area. Please refer to our Service Area Map for other pricing. Price includes: Installation, removal, and rental period of 120 days. Availability: Our Standard 6' Arm post is always available, however our colored posts have limited stock. When our stock has been depleted we remove the option for the specific color(s) from our online order system until we are able to re-stock. Note: Colored Posts are only available with INFO stickers. 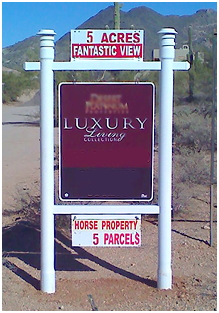 Recommended for Cave Creek and P.V. 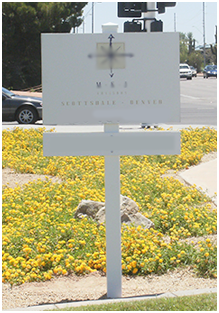 These posts use a single sided sign and are installed parallel with street. 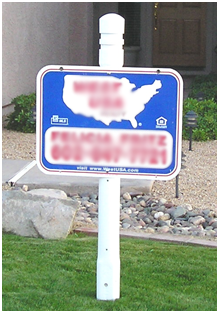 Note: Posts with single signs are generally installed perpendicular with street. Renewals do not apply to purchased post installations and a separate charges, based on 60% of the original invoice, applies for removals. Commercial properties require us to have the property marked for underground utilities. This requires two trips by our installers, one to mark the spot, and then to install the post. Due to high gasoline prices and to keep our installation pricing low some of our extended service areas will be serviced from one to three times per week depending on work flow and demand. For pricing please see our service are map. 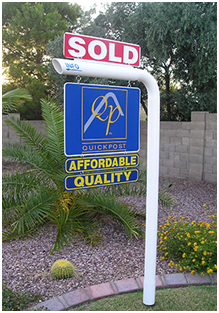 Website Copyright © 2007-2019 Arizona Real Estate Sign Post Installations. All Rights Reserved.